Amazon Echo Input review | What Hi-Fi? Home automation used to be one of tech's money pits. A few years later it's now one of the most lucrative and growing areas of hi-fi, thanks in some part to Amazon's Echo smart speakers. The real cost is your privacy, of course, but as this has been eroded with every Google search or Facebook post made, you might as well appreciate an Amazon bargain when it appears. Amazon's Echo Input is effectively an Echo Dot without the speaker, letting you try out digital living via a smart assistant for less money. The Amazon Echo Input is an 8cm disc of black or white plastic, designed to be ignored rather than noticed. There's no bright ring of LED lights around its edges to let you know that Alexa is listening, no grey fabric on its sides to make it seem prepped for an IKEA mock living room. However, the Echo Input recreates almost every smart feature and function of its bigger, more expensive siblings. A single LED dot on the top lights up when Alexa is enabled, and two buttons beside it let you mute the mic and stir Alexa without a wake word. There are no volume controls on the Echo Input, but this makes sense. This plastic puck needs to be connected to a powered speaker to function. 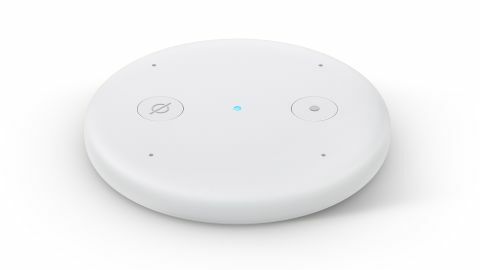 A Bluetooth speaker seems the most likely pairing, and the Input connects to one much like a phone. This is done through the Alexa app, which is a stand-in for the visual interface an Input lacks. Amazon hasn’t revealed the exact Bluetooth tech used beyond ‘A2DP’, suggesting aptX and aptX HD aren't here. However, listening to the Echo Input connected to the kind of sub-£200 wireless speakers that would seem a natural fit, there's no obvious drop in sound quality. Using Bluetooth also lets you place the Echo Input on the other side of the room from the speaker itself. Not placing the two side-by-side is actually a good idea. Amazon Echo smart speakers are remarkably good at hearing voice commands when music is playing, but the Input only compensates for this to a certain extent because it doesn't know the tonal signature or volume of your own speaker. Avoid pointing the drivers directly at the Echo Input's mics and you should have no problems, though. It has the same quad far-field mic array as the Echo Dot. It will pick up your voice at normal speaking volume, even from the other side of a reasonably large room. As the Input separates mics from speakers, you also have greater freedom to position Alexa's ‘ears’ wherever you like. It is powered by a micro-USB cable, so getting hold of a longer power lead, should you need one, is no issue. Using Bluetooth is not mandatory either. The Amazon Echo Input has a 3.5mm output, letting you plug it into an AV receiver or traditional hi-fi via the included cable. This wired connection places responsibility for sound quality onto the Input's DAC, rather than the streamed signal quality. Amazon hasn't published details of the chip used, but other than slightly low volume output, we have no complaints about audio quality, considering the price and the type of hardware that is likely to be paired with the Echo Input. It doesn't have digital or line-level outputs for the true hi-fi fan either, but the Amazon Echo system in general isn't yet geared-up for high-end audio streaming quality anyway. Alexa behaves just as she does through a more expensive Echo Plus. It connects to your home wi-fi and you can use Alexa skills, ask for trivia and set reminders. The main practical considerations relate to the speaker to which the Echo Input is connected. Issues, such as will it go into standby if not used for a little while, and whether your speaker’s standby mode is efficient enough to avoid consuming too much energy when sat there waiting for music. The Input has no control over these aspects, of course, but they are worth considering if you're expecting the Echo Input experience to be as seamless as that of a standalone Amazon Echo. The Echo Input is not a technological revelation, it’s simply an Echo Dot without the speaker capabilities. But, crucially, Amazon has maintained the quality of the Echo experience by using a sensitive multi-microphone array, which lets you interact with the Input in an almost natural manner. Of course, the main benefit over other Amazon products is that you can use the Input with virtually any powered speaker set-up, including your existing kit. That makes it an attractive prospect and the most affordable way to try out Alexa or multi-room audio.